Colebrook Town Hall is located at 558 Colebrook Road, Colebrook, CT 06021; phone: 860-379-3359. Photo: Francis Benedict Jr. House, ca. 1795, 85 North Colebrook Rd, Colebrook, CT. Listed on the National Register of Historic Places in 2002. Photographed by User:Jerrye & Roy Klotz, MD (own work), 2016, [cc-by-4.0 (creativecommons.org/licenses/by-sa/4.0/deed.en)], via Wikimedia Commons, accessed December, 2016. Colebrook was still a wilderness when the Connecticut Colony was threatened by the Dominion of New England in 1686 but the colony's response set in motion a chain of events which lead to its establishment. Fearing the loss its charter and jurisdiction over its unsettled land, the colonial government deeded all of the unsettled northwestern part of the colony (later Litchfield County) to Hartford and Windsor. The crisis was soon over and the colony resumed its charter in 1689, but dispute arose over the Hartford and Windsor claims. It was not until 1726 that a compromise was finally reached by the General Assembly, whereby the two towns retained ownership of the eastern half and the rest reverted to the colony. Colebrook, one of four towns allotted to Windsor, had some of the less desirable land and with Barkhamsted was the last to be surveyed and laid out. 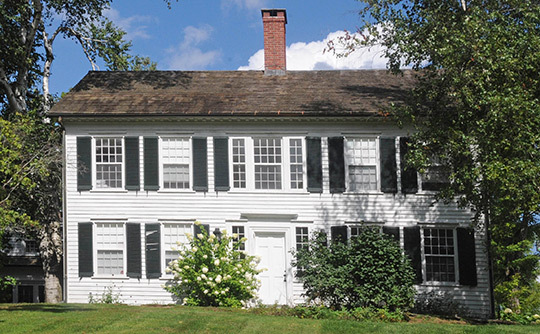 Twenty-nine proprietors, including several from Windsor and East Windsor, began to settle there in 1765. In 1779 Colebrook and Barkhamsted were the last of the colonial towns to be incorporated in the state, but it was not until 1795 that Colebrook was represented in the General Assembly. Jan Cunningham, Cunningham Associates, Ltd., and John Herzan, Connecticut Historical Commission, Colebrook Center Historic District, Colebrook, CT, nomination document, 1991, National Park Service, National Register of Historic Places, Washington, D.C.